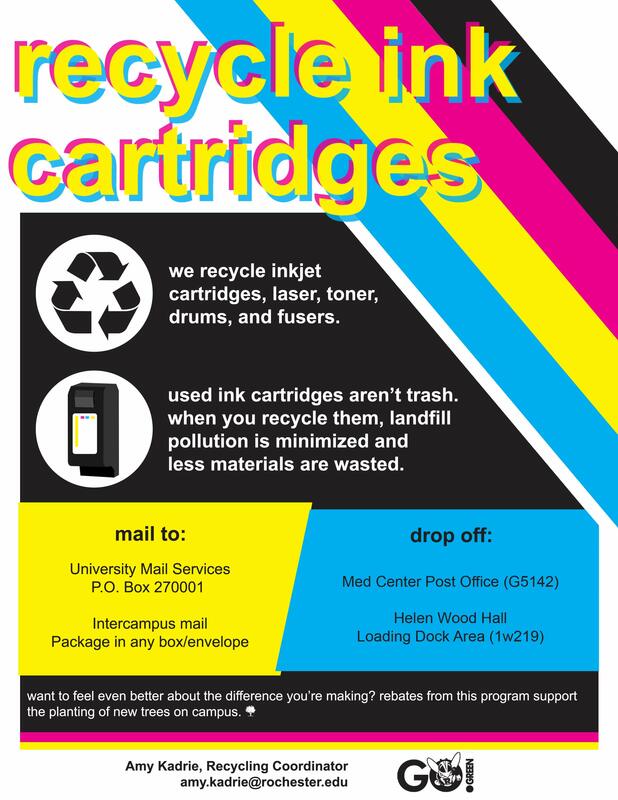 You can mail ink jet and toner cartridges to University Mail Services. Please place in original or replacement packaging and mail to PO Box 270001. The University recycles rechargeable batteries (not alkaline) in accordance with both Monroe County Environmental Services and NYSDEC guidelines. Contact the Environmental Compliance Unit at 275-2056 if your area is interested in arranging a battery collection location. To recycle these materials, obtain a list of available free chemicals, or to dispose of any hazardous wastes, please contact the Environmental Compliance Unit at 275-2056. 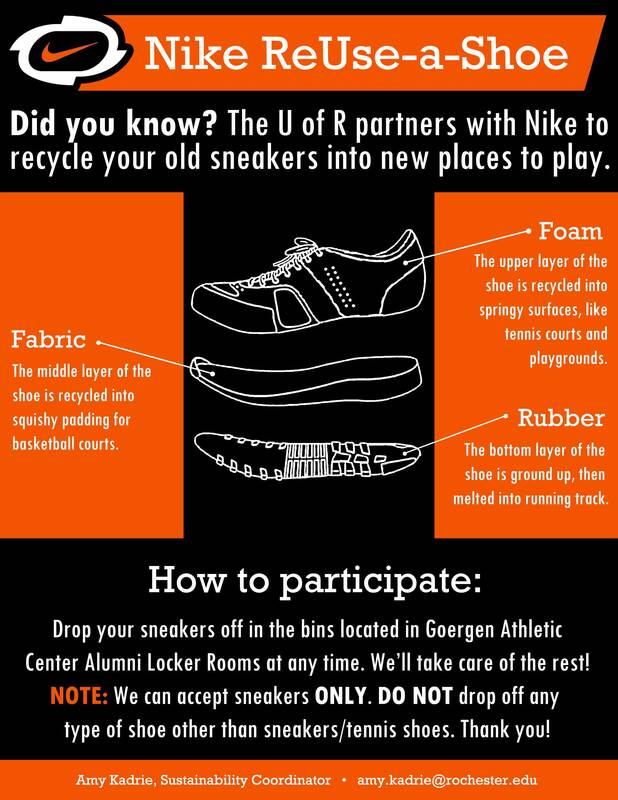 Worn out or unwanted sneakers are collected at the Goergen Athletic Center alumni locker rooms for Nike's Reuse-A-Shoe program. Nike collects shoes and recycles them into athletic fields. 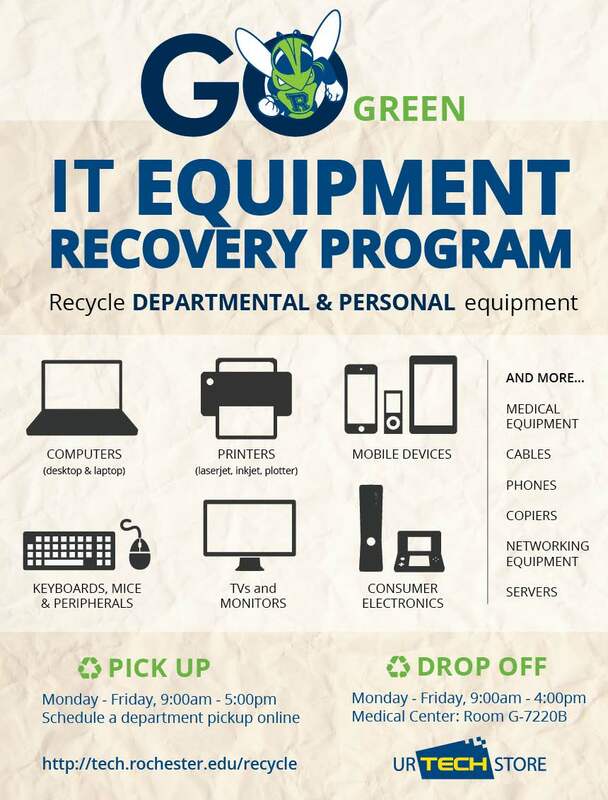 Please see the University IT Equipment Recovery webpage for information about pick-up/drop-off options and what's eligible for recycling. Please contact the Customer Service Center at 273-4567 to schedule a service request. Please mail them to Jim Edmondson, Box 623, URMC. Jim is O&M Project Coordinator and Manager for the Lock/Sign/Door shops. Download and print these posters for your classroom, conference room, breakroom, dorm, or office.